t was the mightiest amphibious military operation in the history of mankind. With literally millions of moving parts, the D-Day landings along the Normandy Coast marked the return of the Allied forces to France, and the beginning of the defeat of Hitler’s “Thousand-Year” Third Reich in France, Belgium, Holland and Western Germany. The assault pitted Supreme Allied Commander Dwight D. Eisenhower against the elite of German high command, Erwin Rommel, and the meddling genius of Winston Churchill against the paranoid micro-manager Adolf Hitler. The Allies constructed an intelligence disinformation campaign of unprecedented cleverness and multi-faceted execution to bamboozle the Germans. French espionage agents planted false information where it could be found by the Abwehr, German intelligence. Phony military props attached to a non-existent army were placed near bogus airfields for German flyover planes to photograph and observe. Electronic communications indicating an army commanded by (the disgraced and currently unemployed) General Patton concocted over a wide region for the Germans to intercept and be led astray. In the meantime, several divisions of airborne troops prepared for landings in the rear of the German coastal defenses and multiple infantry divisions secretly trained to cross the Channel and land on the Normandy beaches. The French underground were tasked with disrupting internal communications and infrastructure. General Eisenhower faced a number of obstacles and command difficulties during the preparation phase. German gunboats got in among landing practice transports at Slapton Sands and that tragedy, combined with losses by friendly fire, killed about 750 American soldiers and sailors, losses that were rolled into D-Day casualties and kept secret from the public. Ike also faced the difficulties of dealing with prickly personalities like British General Bernard Montgomery, who thought he should have supreme command and was always proposing alternate plans, Prime Minister Winston Churchill, who wanted to land on D-Day with the troops, and George Patton, temporarily out of command but zealous to be in on the charge. As the time neared for the great invasion, bad weather rolled in, resulting in a short postponement before Ike made the judgement call to go, hoping for a window of decent seas and unclouded skies. Tank landing ships, with barrage balloons afloat, unloading supplies on Omaha for the break-out from Normandy. On June 6, 1944, the tide carried in more than 5,000 landing and assault craft carrying about 136,000 Allied troops to land on five major beaches and another 20,000 dropped from the air to seize road junctions and bridges, hoping to open the way for the landed infantry to move inland. The Germans were spread too thin in most places, with reserves held out of the fight by puzzled Generals and Hitler himself, who was convinced the landings would be farther north at Calais. Providentially the weather had held long enough to effect the landings and drops. 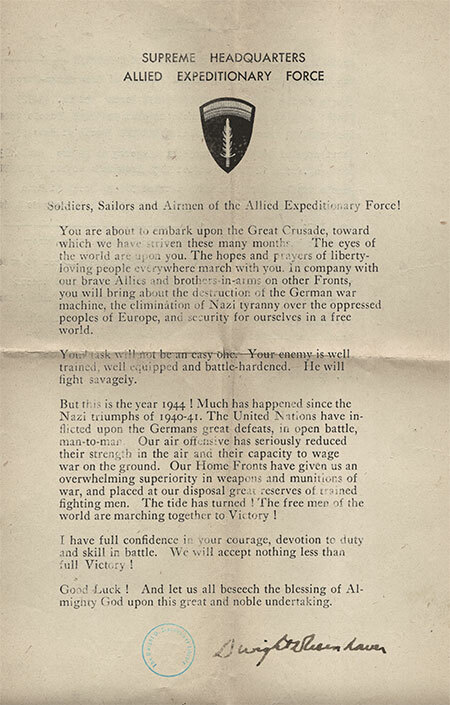 The message from General Eisenhower exuded confidence. 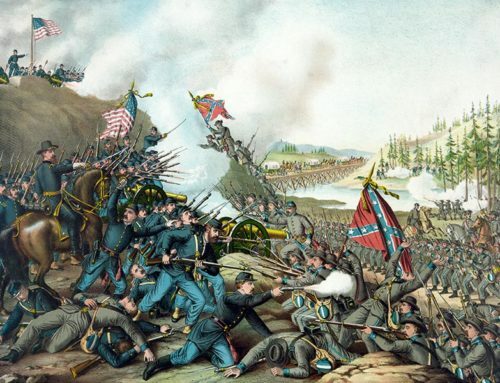 However, he had prepared two possible messages to send to President Roosevelt — one detailing a tragic and costly failed attempt to land the armies in France, for which he took full responsibility. He did not have to send it. 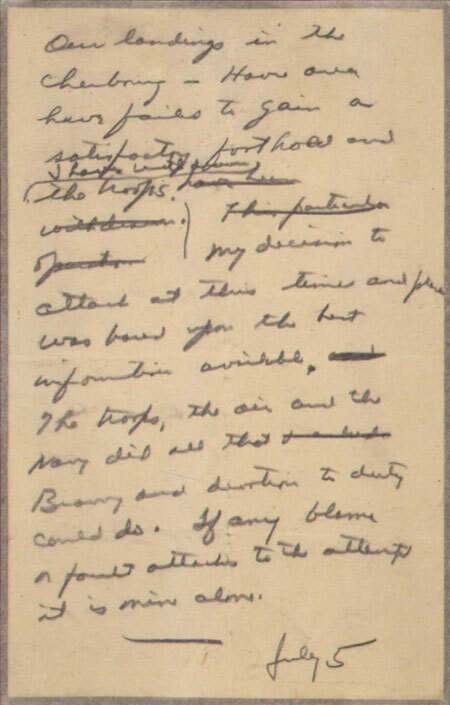 Eisenhower’s letter to the Allied Forces exudes confidence. In a letter that was never sent, Eisenhower claims full responsibility for the failure to “gain a satisfactory foothold” in Normandy. Join us June 6 in New Orleans at the nation’s premier WWII Museum as we honor the valiant men who fought in the War, and remember the Providential Victory of the Normandy landings in 1944.